Independence Day – Democratic Republic of the Congo – every day's a holiday! I ask you to make this June 30, 1960, an illustrious date that you will keep indelibly engraved in your hearts, a date of significance of which you will teach to your children, so that they will make known to their sons and to their grandchildren the glorious history of our fight for liberty. The people of the Democratic Republic of the Congo (formerly Zaire) respect Lumumba’s wishes on June 30, the anniversary of the country’s independence from Belgium, but it’s a day tinged with sadness, as they also remember the death of the man who guided them to independence. 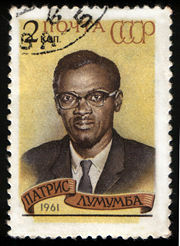 Lumumba also holds the distinction of being the only world leader we know of to have nearly been killed by toothpaste. President Eisenhower was not a huge fan of Lumumba back in 1960. Despite being democratically elected, Lumumba had Soviet leanings, and the Congo held resources vital to the West, uranium being chief among them. The Belgian government had issues with Lumumba as well. His independence speech, at which the Belgian king was present, made it clear that Lumumba would be no puppet ruler, and the Congo would be no colony. The CIA installed an operative (Larry Devlin) to be prepared to assassinate Lumumba at a moment’s notice. The weapon of choice: a tube of poisonous toothpaste to be planted among the Prime Minister’s toiletries. For whatever reason, the CIA never gave Devlin the order. Instead, in September 1960, the charismatic Lumumba was deposed in a CIA-supported coup d’état by his former aide, Colonel Joseph Mobutu, and was executed the following January under mysterious circumstances. Mobutu went on to control the country for over 30 years, renamed it Zaire, and embezzled over $5 billion from the nation’s purse. Mobutu lost power in 1997, and the country became the Democratic Republic of the Congo. The battle for power in the DRC since 1997—also known as the African World War—has been cited as the deadliest conflict since World War II.